I need to write a bash script wherein I have to create a file which holds the details of IP Addresses of the hosts and their mapping with corresponding MAC Addresses. Is there any possible way with which I can find out the MAC address of any (remote) host when IP address of the host is available? If you just want to find out the MAC address of a given IP address you can use the command arp to look it up, once you've pinged the system 1 time. PING skinner.bubba.net (192.168.1.3) 56(84) bytes of data. 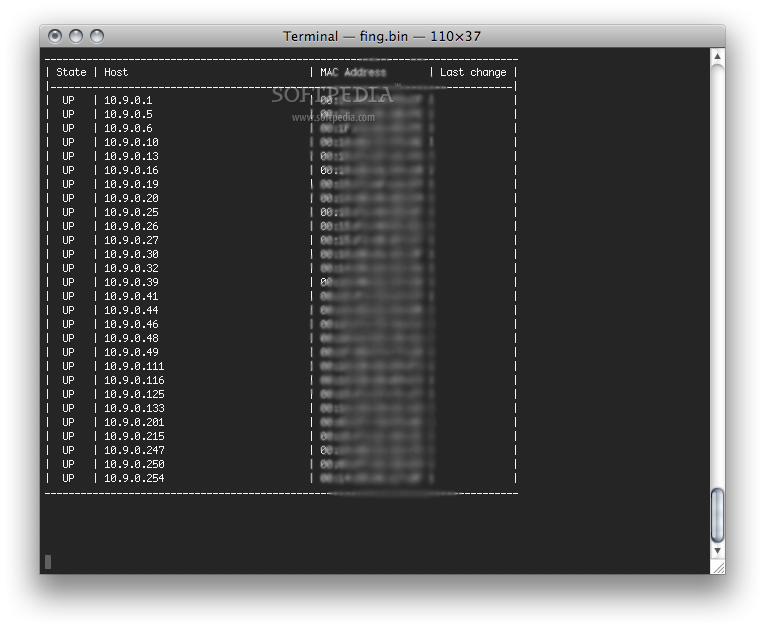 If you want to sweep the entire LAN for MAC addresses you can use the command line tool fing to do so. It's typically not installed so you'll have to go download it and install it manually. But you can only use this command in LAN, if you want to find out the MAC address of any remote host, maybe you must use some tool to capture the packet like tcpdump and parsing the result. This is from my question and answer in askubuntu. -sP (Skip port scan) . This option tells Nmap not to do a port scan after host discovery, and only print out the available hosts that responded to the scan. This is often known as a “ping scan”, but you can also request that traceroute and NSE host scripts be run. This is by default one step more intrusive than the list scan, and can often be used for the same purposes. It allows light reconnaissance of a target network without attracting much attention. Knowing how many hosts are up is more valuable to attackers than the list provided by list scan of every single IP and host name. -PE; -PP; -PM (ICMP Ping Types) . In addition to the unusual TCP, UDP and SCTP host discovery types discussed previously, Nmap can send the standard packets sent by the ubiquitous ping program. Nmap sends an ICMP type 8 (echo request) packet to the target IP addresses, expecting a type 0 (echo reply) in return from available hosts.. Unfortunately for network explorers, many hosts and firewalls now block these packets, rather than responding as required by RFC 1122. For this reason, ICMP-only scans are rarely reliable enough against unknown targets over the Internet. But for system administrators monitoring an internal network, they can be a practical and efficient approach. Use the -PE option to enable this echo request behavior. -A (Aggressive scan options) . This option enables additional advanced and aggressive options. 192.168.1. * Range of IPs. replace with yours. arping is provided by package iputils-arping on Debian. Not the answer you're looking for? Browse other questions tagged linux bash mac-address or ask your own question. How does FING (or any of the IP/MAC Address Mappers) work? How to use shell to derive an IPv6 address from a MAC address? Command-line tool to obtain OUI vendor info from MAC address? How to improve performance in generating MAC addresses with od?